Pedestrians will keep right and left side will be reserved for VVIPs and emergency vehicles. As Christians prepare for the yearly pilgrimage to Namugongo shrines for the Uganda Martyrs Day celebrations on 3rd June of every year, traffic police has issued guidelines for traffic regulation showing which roads are accessible and those that are cut off. According to a statement issued on Wednesday 30 may 2018, traffic officials say there will be cut off points in areas such as Nalya Roundabout, Kireka Trading centre, Kiira Town Concil Roundabout, Bweyogerere Tading Centre, Seeta Trading Centre and Kyaliwajjala Trading centre. “Private vehicles, taxis and motorcycles will not be allowed beyond the inner cut off points,” said SSP Norman Musinga, the Kampala Metropolitan Traffic Commander. He noted that there will be no parking for the general public at both Catholic and Anglican Churches. “There will be normal traffic flow along Jinja-Kampala Highway. VIPs with vehicles bearing stickers will be allowed to access their parking adjacent to both shrines. Only VIPs with vehicles to the Catholic Church bearing red stickers will access Namugongo through Kyaliwajjala via Ssemambo road and park at Namugongo Boarding Primary School,” SSP Musinga added. 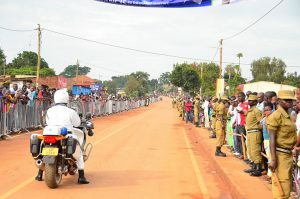 Meanwhile, VIPs with vehicles to the Anglican shrine bearing red stickers will access the venue through Bweyogerere, Butto Road and park at the Protestant Playground. “Foreign pilgrims to the Catholic Church with vehicles bearing blue stickers will be dropped off at Kyaliwajjala Trading centre and the vehicles will park at Vienna College School,” he said. However, pilgrims from Northern Bypass from areas of Ntinda, Hoima road and Bwaise will park at Hillside Nursery and Primary School and St. Peter’s SS-Nalya. Pilgrims from Northern route via Kasangati will park at Kiira Town Council Playground and Kiira Municipal Council (Mayor’s) Gardens. Pilgrims to the Anglican Church will access the venue through Seeta, Sonde, Bweyogerere and Butto Road and park at Church Farm and All Sisters’ Parking. Pilgrims to the Anglican Shrisne from Kiira Town Council can access through Mamerito Road via Kironde Road to Namugongo Road and park as directed by traffic police. Pilgrims from Eastern Route to the Catholic Church will access the venue via Kireka. Police further noted that from Kyaliwajjala Trading centre to the venue will be pedestrian walkway. Pedestrians will keep right and left side will be reserved for VVIPs and emergency vehicles. Public service buses will be allowed to drop those intending to use public means at Kyaliwajjala and Butto-Namugongo near Anglican Church. Buses accessing Kyaliwajjala from Kireka will connect back to Kireka via Nalya as the road from Kireka to Kyaliwajjala will be one-way. Musinga noted that whoever contravenes any of the guidelines will be dealt with in accordance with the Traffic and Road Safety Act 1998. ALSO READ:Real Madrid, Barcelona or Atletico: Who have had the best season?